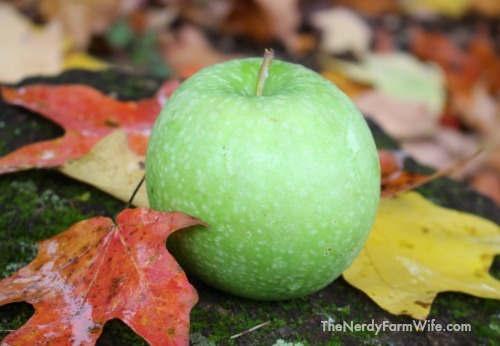 This soap recipe was inspired by a trip to my local apple orchard on a beautiful fall day. It features freshly pressed apple cider (unsweetened apple juice could work well too), along with the subtle warm spicy scent of essential oils. While the scent of the apple cider won’t make it through to the final soap, try using essential oil option 2 (below) to regain a hint of fruitiness in the finished soap. If you’ve never made soap before, be sure to thoroughly research the process and precautions before trying this recipe. 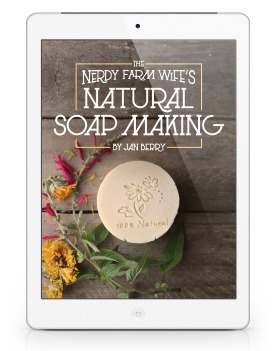 Want to see how apple cider soap is made? Check out this wonderful video from The Soap Throne! 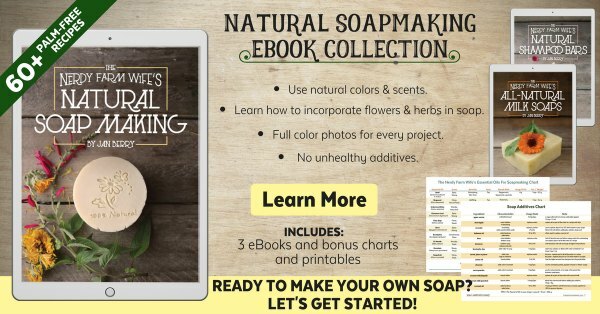 You can find more information in my Soap Making 101 post (HERE) or check out my Natural Soap Making Ebook Collection (HERE). Tagged apple, apple cider. Bookmark the permalink. Although I may also be tempted to eat/drink this soap, Jan, I’ll bet it smells great, particularly in the bath. Thanks again for such a painstakingly prepared and informative post. Thank you for the kind comments Farmer Doug. :) I hope you and yours are doing well! May you please give how to make it? you listed the ingredients, but not the how. Hi! The link below will be updated soon, but the information in it is still accurate & should help! Thank you, that’s where I was confused… in the rest of the world, apple cider IS alchoholic. We would just call your sweet/soft cider ‘apple juice’. It’s all apple juice for us, if it’s filtered or treated, or just raw or sweetened. I was wondering how you could use something alcholic like that for the water! Now, I get it. If you were to use an alcoholic beverage for your liquid just let it go flat. Some also recommend freezing it! Is there an expiration date on this soap since you used food as an ingredient? Hi Michele, That’s a great question. In general, the alkalinity & heat generated during saponification prevents spoilage. It should stay fresh at least 9 months to a year. The bigger cause of early rancidity in soap is usually an overly high amount of oils compared to the amount of lye or using oils that are past their prime. If your soap starts to smell like old, rancid oil, it’s time to toss it. Hi Osiris, Can you write out and tell me the exact recipe that you used and how much water and green tea you added? Then I can look at it and see if I can help! Like I said, this recipe works for me, but when I add green tee instead of water, and still using the same amount, (12 oz) the recipe no longer worked. Could be because the lye was static? Thanks for your help! Thanks, Jan, you are wright, I bought my 4 pounds of lye at the Amish, and it was fine but after a while it did get lumpy. Does this soap retain any of the apple scent or just the spiciness from the eo? I’m trying to find a way to create an apple scented cold process soap without using fragrance oil. Hi Elisa! This soap just has the spiciness from the essential oils. I’m not sure if there’s a way to create a natural apple scent in soap, but if you find a way – we’d love to hear about it! I was wondering if you could substitute the caster oil, mango butter, and avocado oil for palm oil and shea butter? If so, what would the recommended amounts of each be to put into this recipe? I’m confused. Regular apple cider or Apple juice in the soap? Hi Dana! I use regular apple cider that has been freshly pressed from my local apple orchard. (You may be able to find some in the refrigerated section of grocery stores too though.) Unsweetened apple juice could work too! How much does this make? I’m used to doing 5lb batches- how much would that be? I’m super new to making soap and still figuring out the headache that is lye calculator. Hi Biz, Yes, the lye calculator can be painful at first! (especially for non-math-brained types like me!) :) To find out how many pounds of soap that a recipe makes, just add up: lye + water + oil weight. So, for this recipe (I round numbers): 4 oz lye + 9 oz liquid + 30 oz oils = 43 ounces total. Then divide that 43 ounces by 16 ounces in a pound and you get 2.7 pounds so you’d need a three pound mold to fit it in. I hope that helps! Thanks for sharing those tips Holly! My favorite calculator is the one at Majestic Mountain Sage too. I was wondering if the sugar content in the apple cider speeds up the gel process? Do you have a high heat reaction? Also do you insulate for this batch? Could I use fresh pressed grapes in place of apple cider in the same manner, expecting similar results? Thank you! Hi Lyddie! I didn’t notice any unusual speeding up in this soap, but with juices and such, it is good to work with lower temps and even chill your juice before adding lye. I don’t believe I insulated, because of the added sugars in the cider. I haven’t tried fresh pressed grapes in soap, but I’ve read of people trying grape juice before – the consensus seems to be that it turns brown in the soap, but the sugars add bubbles and a nice lather to the finished bars of soap. Can you use this recipe as hot process? Or can I use a basic recipe and just change the water to cider? Hi Josie! I haven’t tried apple cider in hot process soap, so I’m really not sure how it would do. If you do decide to test it out, I’d try only a small basic recipe batch and probably dilute the cider with water by at least half (or more.) I’m not sure how the sugars in the cider will do in the heat – if you can find a HP recipe online that uses juice and see how they handle adding it, it might give you a better idea! Did the soaps take on an apple-ish smell at all? I was going to try this exact same thing but chickened out. 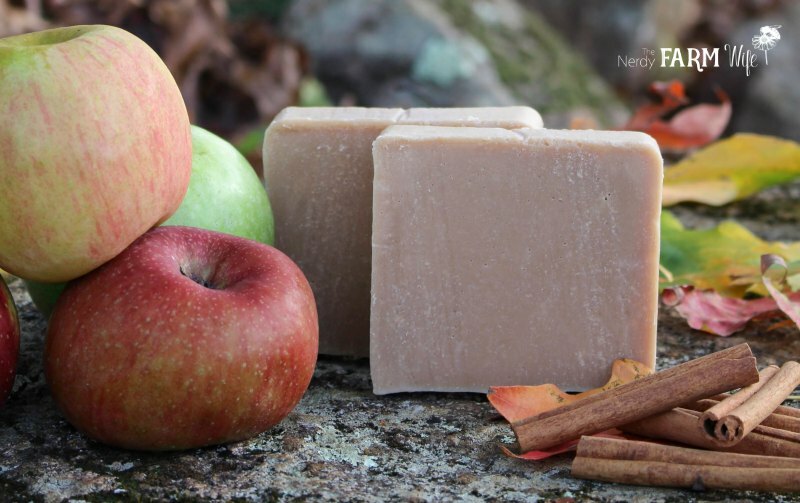 I’ve never made apple cider handmade soap but I would love to try it. The apples and cinnamon sounds delicious too. I’m going to make this recipe next but was hoping to use just castor, olive and coconut oil since I don’t have the others (I do have almond, jojoba, hemp and rosehip but don’t want to use them in soap as they’re more expensive). Can I just omit the avocado and mango or do I need to substitute something else? I know I will need to run it through the lye calculator once I know which oils to be using. So just to confirm, instead of using water, I sub-in apple cider to mix the lye in with, correct? I’m also wanting to substitute cardamom for the ginger or maybe do half and half. I bought some handmade apple cider & cardamom soap which I absolutely love and what inspired me to start making own because I can’t find that soap locally! Hi SP! Yes, you sure can make a soap with just castor, olive, and coconut oil. And yes, instead of using plain water for the lye solution, use apple cider (or half apple cider/half water) instead. You can also use a favorite recipe you’ve already made before and know for sure that you like and just use apple cider in it instead, with your cardamom scent at trace as planned. It sounds like a lovely combination and should make a terrific soap – I hope it turns out well for you! Been reading all the comments. I want to make soap but never have attempted. This Christmas I want to give all hand made items. Quilts, soaps, laundry cleaners, etc. Is it hard to learn the process? Have you every drank warm mulled apple cider? Yum! I might make some this week to see how if would work in the soap recipe and then omit the EOs. I am also making the pumpkin spice soap so they will be cured by fall. Seriously have spent a few hours on this site today. So many great ideas! How many bars of soap does this make? Hi Cara! This recipe is almost 44 ounces (oil + liquid + lye) or 2.75 pounds. I use a non-standard homemade loaf mold, but usually find that batches this size will make around 7 or 8 bars, depending on how you cut them. I’ve tried this twice now and get a violent reaction when I stir the lye and cider. I have had no issues with using distilled water and the cider is fresh pressed. Is there something I am missing? Hi Colby and yikes! Is your cider chilled and still cold from the refrigerator? Cold is good and colder is even better. You could try freezing the cider in ice trays and using half distilled water and half frozen cider & making it somewhat like a milk soap, with low temperatures. I’m curious if the pH of cider varies depending upon the orchard making it? Or maybe even upon that year’s crop? Our local orchard cider is generally very sweet. Is your cider sweet or is it more tangy tasting? I hope to grab more of this year’s cider soon and I’m going to test the pH of it, out of curiosity, then I can add that to the recipe, in case it’s a factor. Just curious,could Colby be having a respitory allergic reaction to the powdered lye ? If so what could one use in the place of it ? Hi Friend! I think Colby meant a violent reaction as far as the liquid got too hot and started to bubble over. You definitely want to avoid breathing in lye powder too though! 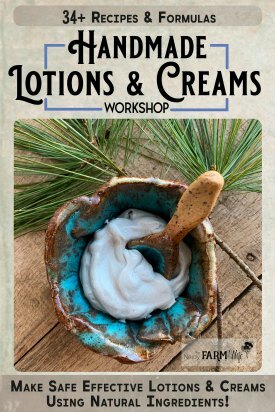 There’s no replacement for lye in soapmaking (oils can’t turn to soap unless a caustic substance, such as lye, is introduced to them), but if you’re worried about breathing in the fumes/powder, you could use a mask with respirator on it. Could all of the oils in this recipe be substituted with the oils for the rosa rogusa recipe? Hi Layla! Yes, you’re exactly right. You could take the entire rosa rugosa recipe (oils + lye + amount of liquid) and instead of 26 oz rose tea, use apple cider (or diluted apple cider) instead. At trace, instead of rose scents, you could add the cinnamon and ginger essential oils. You could really take that one rosa rugosa recipe and make tons of different soaps from it, simply by changing it up with teas, infused oils, essential oils and extras like oatmeal, clays or colorants. Can this recipe be made with out any oils? I am extremely allergic to coconut, Shea, olive oil, cocoa butter or any type of nut. Hi Anne! In order to make soap, you have to combine oils or fats with a caustic solution (lye), but there should be some options hopefully for you! Can you use animal fats like Lard (from pig) or Tallow (often made from beef)? There’s also Rice Bran Oil or Sunflower Oil (a seed) or Hempseed Oil (also a seed). What oils do you use for cooking? You should be able to use those for soapmaking as well. Do you think I can use half apple cider/ half goats milk? I’m out of avocado oil-what could I sub? Hi Savita! The kind I used can be found at Amazon (there’s a link in the ingredient list). You could also check local hardware stores; sometimes they have some, but check the bottle before using. If you shake it and hear lumps rattling around inside, that means it’s past its prime & won’t measure correctly. Did you use cinnamon leaf essential oil? I’ve seen cinnamon bark & cinnamon cassia but not sure if either of these can be safely used in soap. Thanks a lot for the recipe, I love it! Did you add colorant or is it just from the natural apple cider? Hi Emily! There isn’t an apple essential oil available, but you can use apple fragrance oil and cinnamon essential oil, only check the fragrance suppliers guideline to make sure not to use too much.